Max. Pulling Tension: 168 lbs. 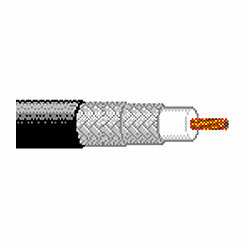 Conductor Material & Diameter: 22 AWG (7X29 AWG) bare compacted copper .031" nom. Dielectric Material & Diameter: Polyethylene, .193" nom. Shield type & % coverage: 1st layer - TC braid; 95%, 2nd layer - TC braid; 93%. Jacket Material & Diameter: PVC, .305"